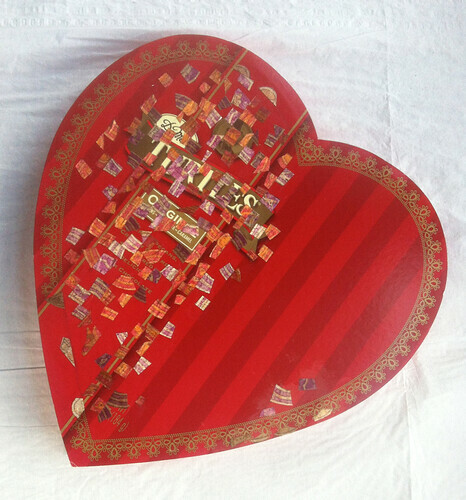 Another Heart Shaped Box (As of March 30, 2013), a photo by randubnick on Flickr. Trees and Colorado Mountains (Revised as of March 30, 2013), a photo by randubnick on Flickr. Yesterday I posted a drawing that I found in an old sketchbook, a landscape of the Colorado mountains. 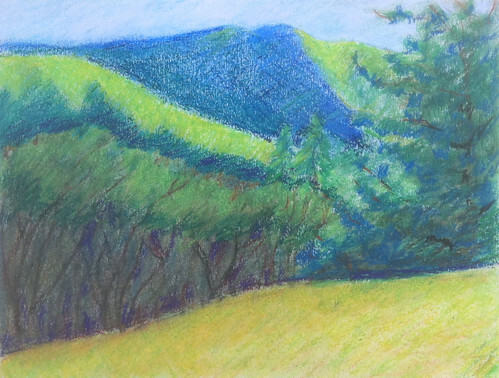 This morning I determined that the drawing was done with oil pastels. (I was able to match some of the colors.) And I decided to do a little more work on this drawing, to see if I could finish it. I wanted to make the line of shrubs show up against the mountains, so I started by adding some shadows for contrast. I also added some shadows to the mountain in the distance, and to the branches of the shrubbery. There is still more work to do. 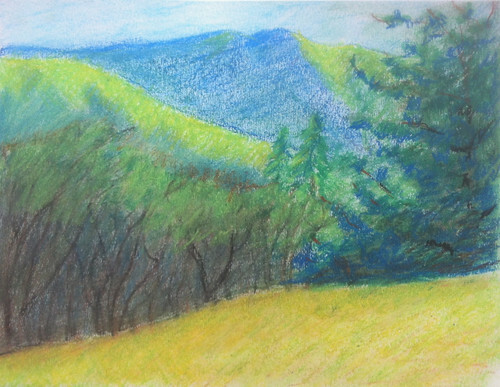 Trees and Colorado Mountains (Drawing from Sketchbook), a photo by randubnick on Flickr. This is a drawing that I found in an old sketchbook of mine. There's no date, but this looks like drawing from observation. I think this is from a trip to Colorado, maybe to Snowmass or Breckenridge, sometime in the 1980s. I think this is done with craypas (oil pastel) or maybe a combination of crayon and conte crayon. Anyway, I like the composition and the color. I don't think I finished it. (It doesn't look finished to me now.) 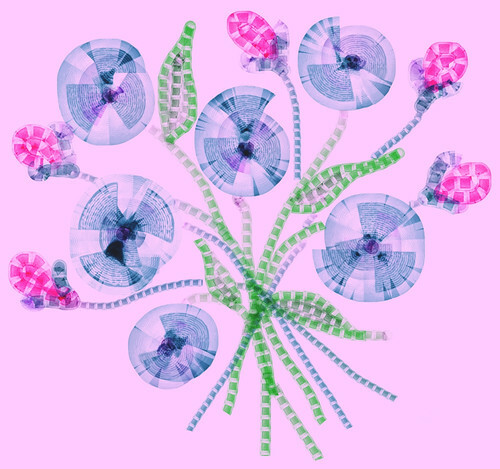 Anyway, I am thinking about working on it some more. . . .
Fast Flowers (Digital Impasto) Day 2, a photo by randubnick on Flickr. A few days ago (March 24), I started a digital painting with Painter 12's digital oil impasto. I wanted to use bigger, looser brush strokes, so I decided on a still life and a time limit of 30 minutes. Well, I actually worked on the image for an hour. Today I went back to do some cleanup. I corrected mistakes as I went along, and decided to change the shape of one of the blossoms because the placement wasn't making sense to me. This took me another hour So here are my (not so fast) flowers. 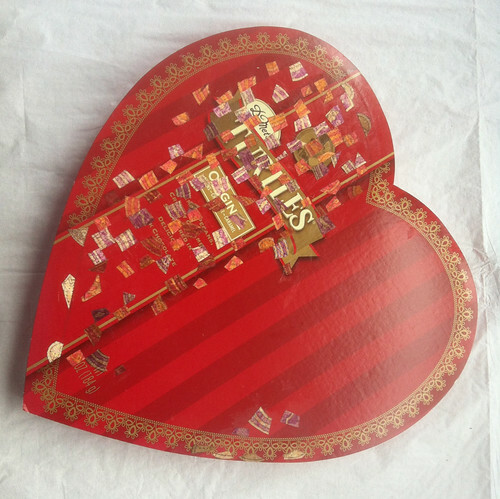 Another Heart Shaped Box (As of March 25, 2013), a photo by randubnick on Flickr. Matza Flower Bouquet, a photo by randubnick on Flickr. Today I created this little still-life fantasy with Painter's pattern pen, using my matza pattern. (See post for March 25.) If you look closely, you can see the matza pattern in the stems, leaves, and flowers. Lotsa Matza in Blue, a photo by randubnick on Flickr. Back in 2009, I used Painter to "capture" a pattern from my posterized photo of a piece of matza on a paper towel. 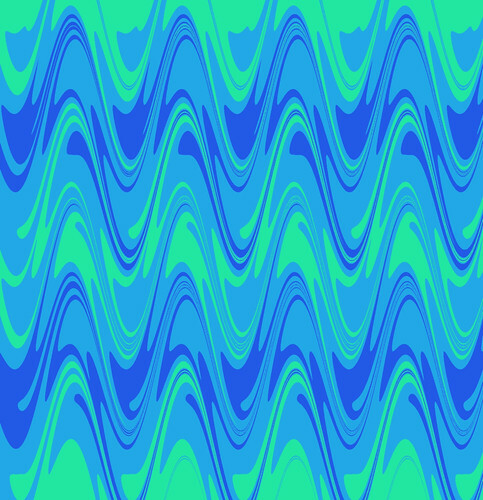 Very simple, but it made a nice pattern and I used it to make several images. Unfortunately, when I upgraded Painter, I lost some of my patterns. (It happens every time and I don't know why.) Today I decided to recreate the pattern. I found the photo of matza in my iPhoto library and imported into Painter 12. 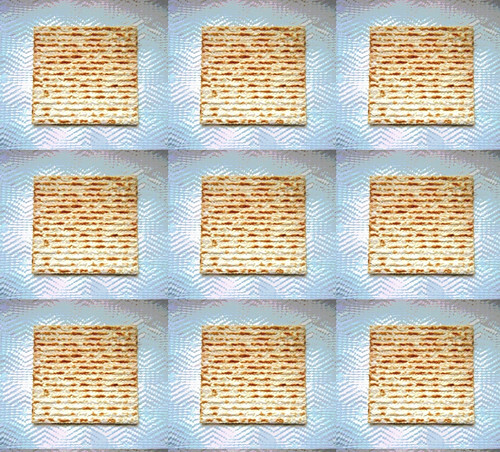 I captured it as a pattern, and then used the pattern to create this image of "Lotsa Matza". I added the blue overlay to distinguish this from the earlier version. Fast Flowers (Digital Impasto), a photo by randubnick on Flickr. I have been practicing using Painter 12's "digital impasto", and today decided to try again. 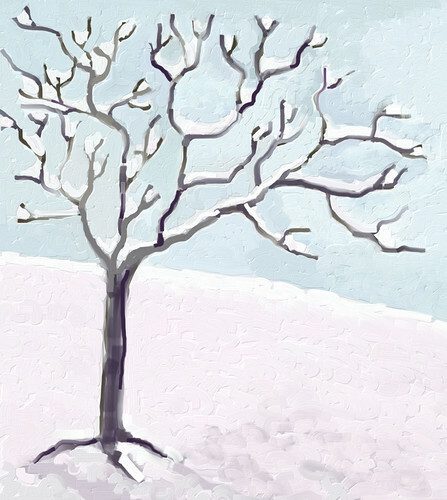 Although I was happy with the results of my last attempt--Snow and Tree (Digital Impasto) posted Mar 22--I was frustrated with the process, which was very slow, and the approach (very small, tight brush strokes). 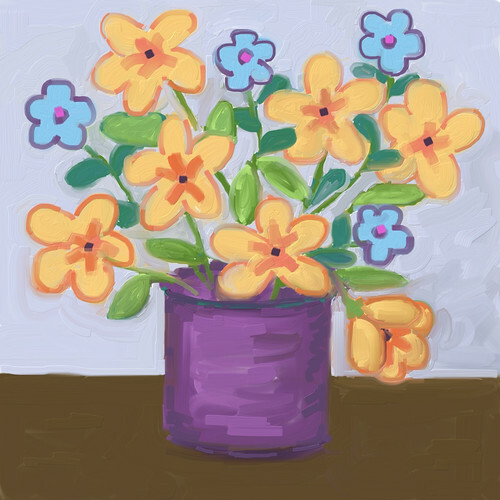 So today I decided to paint flowers, go for big brush strokes, and give myself a time limit of 30 minutes (hence the title). Well, I actually worked on this for an hour, but I was still much happier with the process. These flowers could probably use some more work (maybe tomorrow or the next day), but they were fast enough. Maybe I am getting somewhere. March at Bradley Palmer (Posterized Photo), a photo by randubnick on Flickr. This morning, on the way home from the vet, we stopped at Bradley Palmer State Park for a quick walk. I liked the way the trees looked against the snow so I took some pictures. Tonight I cropped this image out of one of the photos, and then used Painter 12 to create a posterized version of it. Snow and Tree (Digital Impasto) Day 3 Final, a photo by randubnick on Flickr. This afternoon I did some more work on this image, a digital "painting" done with Painter 12's "digital oil impasto". Today I continued to modify the brush strokes, making them smaller. Most of the time I worked on the ground, and then I went over the branches, added some purple accents. Finally I transferred the image into iPhoto where I straightened it out and cropped it. Snow and Tree (Digital Impasto) Day 2, a photo by randubnick on Flickr. Yesterday I started this little digital painting using Painter 12's "digital oil impasto", which I am trying to learn to use. So I kept going with this image today. I had been having trouble with the digital "paint" starting to smear, so I decided to try small and shorter brush strokes. That seemed to help, but it is taking forever. I plan to work on this again tomorrow. At this point, I think it would have been faster to paint this with actual oil paint on an actual canvas! But I am trying to learn something new. Snow and Tree (Digital Impasto), a photo by randubnick on Flickr. Tonight I used Painter to make this little digital painting, using the digital impasto oil brush, something I am trying to learn. The imagery is fairly easy, inspired by our recent snowstorm. 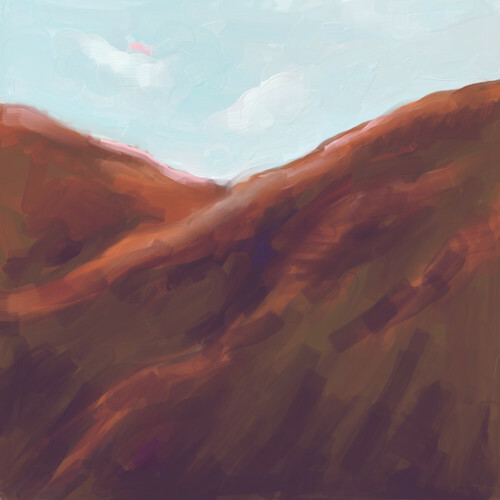 But even with the easy subject matter, I was really struggling to control the brushes and the "digital paint". This is only the second time I have tried the impasto oil brush. (In Painter, each type of "digital paint" acts differently, emulating what would happen with the real life paint. So in digital impasto, the "paint" goes on thick at the beginning of the stroke, but then the color fades and blends with surrounding color, just like real oil paint.) Well, I was getting pretty frustrated until I realized that i needed to let go of the idea of control. This is a work in progress, not a finished piece. I plan to work on it some more tomorrow. 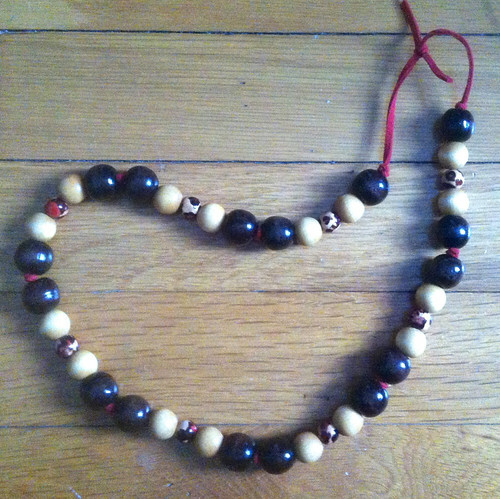 Necklace with Wooden Beads on Red Suede Cord, a photo by randubnick on Flickr. I designed this necklace yesterday, and put it together this afternoon: wooden beads (dark, light, and painted) on a knotted red suede cord. Nice project for a snowy day. Spring Green, a photo by randubnick on Flickr. Snow expected tonight, here north of Boston, but I am hoping for spring. Here is a little image that I created tonight on my iPhone, with the Brushes app. Driving Through Connemara (Posterized Photo), a photo by randubnick on Flickr. This image started with a picture that I took during a trip to Ireland in 2004. We were near Galway and got lost driving through the rocky Connemara hillsides. I was taking pictures from the passenger seat of a moving car (as usual). These are not the lush, emerald green fields that most people associate with Ireland. The landscape is beautiful, but stark, and even seemed desolate to me at the time -- not just because we were lost, but because of awareness of the hardship faced by people trying to make their living on this rocky land. Today I cropped this image out of the original (to remove windshield, road sign, etc. The result was small so I used Painter to resize the image, and then used a combination of posterizing and woodcut effect (and a little digital pastel) to create an image that I could use. I then did a little more adjustment in iPhoto and here it is. 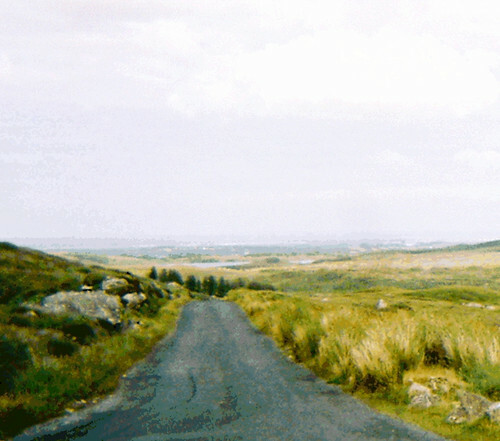 I remember the scenery of this beautiful drive, and the lessons learned about Irish history along the way. Necklace with Four Colors (Finished Day 2), a photo by randubnick on Flickr. Today I worked on the necklace I started yesterday. I think it is finished, but I reserve the right to revise. 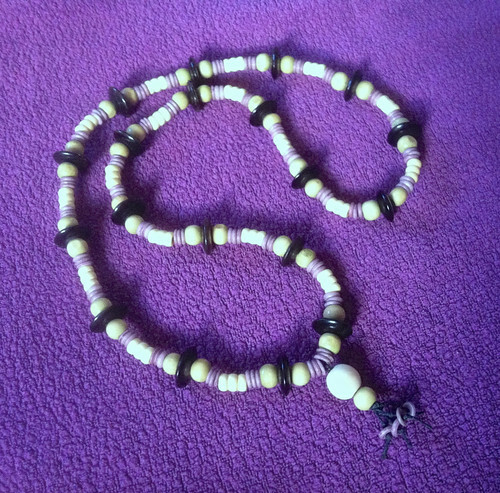 Beads in four colors (black, cream, olive green, and purple) and four shapes on a black cotton cord. Necklace with Four Colors (Day 1), a photo by randubnick on Flickr. I started making another necklace today. It was a busy day and time was short, but I had enough time to work out the design and get it started. There design looks simple, but I tried out a number fo combinations till I arrived at design I want to use. 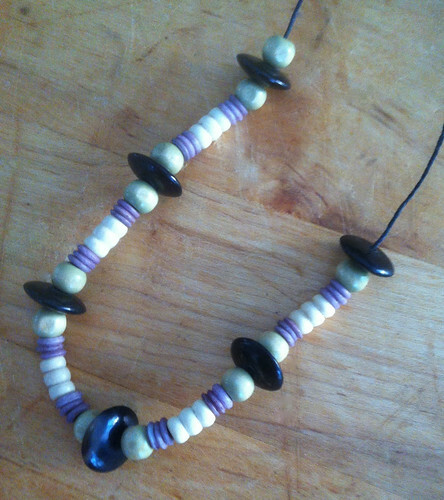 I am using black wooden disks, turned wooden beads in cream, pale green wooden spheres, and tiny purple disks. (I am not sure if they are wood or some other material). I am stringing them on a cotton cord. I only had time to string about five inches. To be continued. March Day at Obear Park (Digital Woodcut), a photo by randubnick on Flickr. March Day at Obear Park, a photo by randubnick on Flickr. 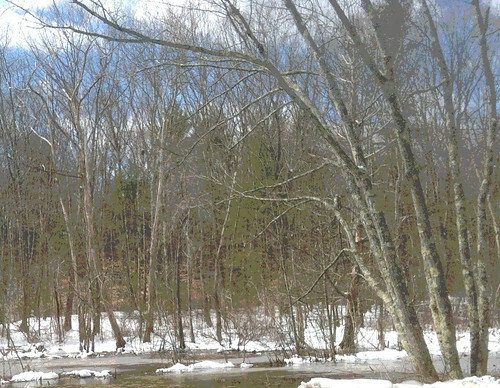 The weather has warmed up and much of the recent snow is melting away. 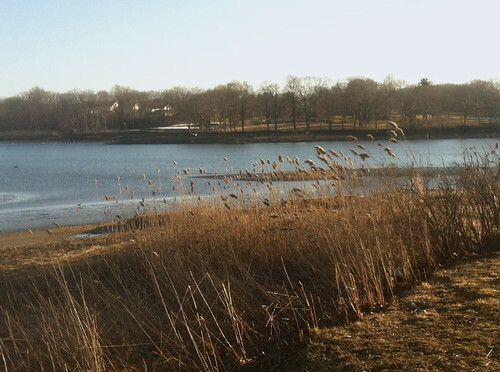 This afternoon, it was warm enough for a short excursion to Obear Park, here in Beverly, MA. You can still see some snow on the ground over in Salem, just across the water. 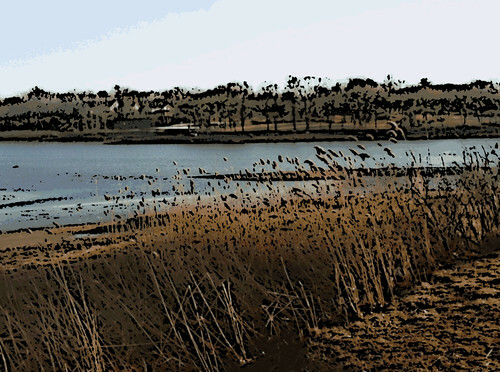 I liked the winter grasses against the water, so I took this picture. Tonight I used iPhoto to edit the image, and cropped it to get this composition. 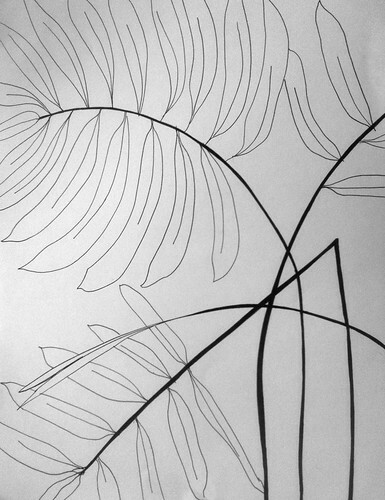 Tropical Plant (Pen and Ink), a photo by randubnick on Flickr. Purple Leather Necklace with Wood and Gold Metallic Beads and Bells, a photo by randubnick on Flickr. I have been working on this necklace for a couple of days, and finished it late this afternoon. I combined pale wooden beads with textured gold metallic beads and bells on a knotted leather cord. This can be worn as one long necklace, or doubled and worn as a shorter necklace, as shown here. Colorado Morning (Digital Impasto), a photo by randubnick on Flickr. This is a digital painting that I created tonight using Painter's digital impasto (a digital emulation of thick oil paint). I worked from imagination and memories of the Rocky Mountains of Colorado, my home state. It's not surprising that I painted mountains, because I love the mountains. And it is also true that I often paint mountain landscapes when I am using new media, so this was a practical choice to use with digital impasto, which is something I rarely use. But I also paint the mountains when Colorado is on my mind. Snow and Street (Digital Woodcut), a photo by randubnick on Flickr. 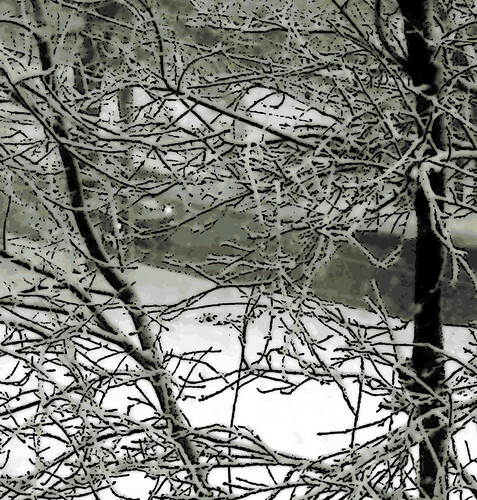 Tonight I used Painter to add a digital woodcut effect to the photo that I posted here day before yesterday, a view from my window on a snowy day. 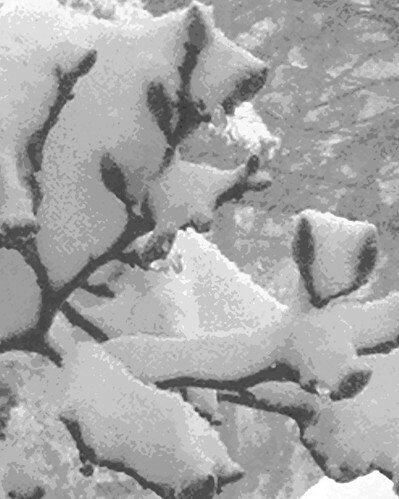 Snow on Magnolia Branch (Digitally Modified and Posterized Photo), a photo by randubnick on Flickr. Here in Beverly, MA, we were expecting about three inches of snowfall overnight, but by morning it looked like at least six to eight inches to me, and it kept going most of the day. From my home studio window, I had a view of the snow on the magnolia tree, so I took some pictures. I used iPhoto to crop the image, then I opened the image in Painter where I used digital airbrush to soften some of the wires in the background, to simplify the background and focus more attention on the magnolia branches. Then I posterized the image in Painter. Posterizing simplifies shapes and colors. When I got the shapes simplified as much as I wanted, I was getting more color than I wanted. So I went back to iPhoto and transformed the image into black and white. Then I did a final crop in iPhoto to get this composition. This is a lot of trouble to go to, I suppose. But there's something about a snow-covered magnolia tree, with buds already visible under the snow. The beauty of fresh snow on branches is fleeting, even more fleeting than the beautiful big pink and white magnolia blossoms that will appear in mid-April. Snow and Street, a photo by randubnick on Flickr. This morning it was snowing. I took this photo from an upstairs window. 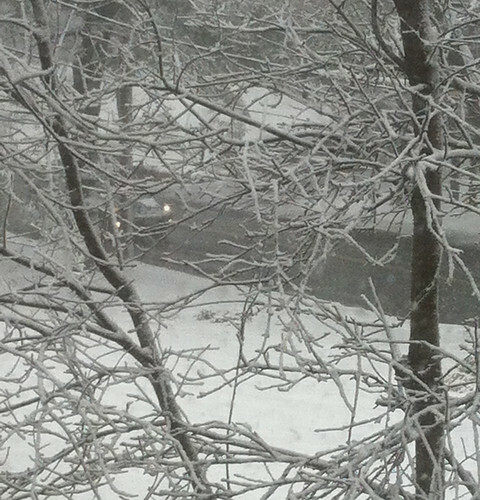 The snow was coating the branches, creating a nice tracery, but it wasn't so cold that the snow would stick to the road. Tonight I used iPhoto to crop the original photo to get this composition. Blue and Green Marble Pattern, a photo by randubnick on Flickr. Here is yet another image that I created on the computer, using Painter 12's marbling effect. I have been experimenting with different colors and different proportions, and then fiddling with the various controls to learn more about what they do. Sunny Samba Marble Pattern, a photo by randubnick on Flickr. 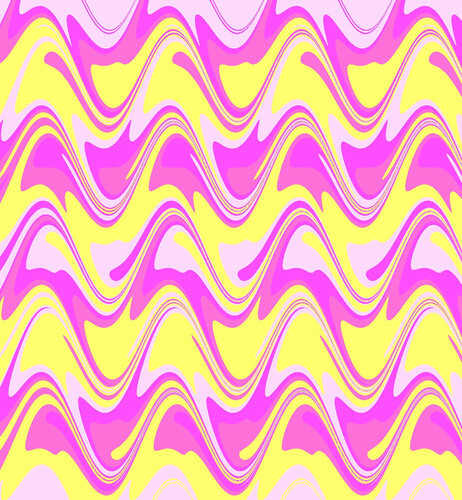 Here's another pattern that I made tonight with Painter's marbling effect. I also posterized it. 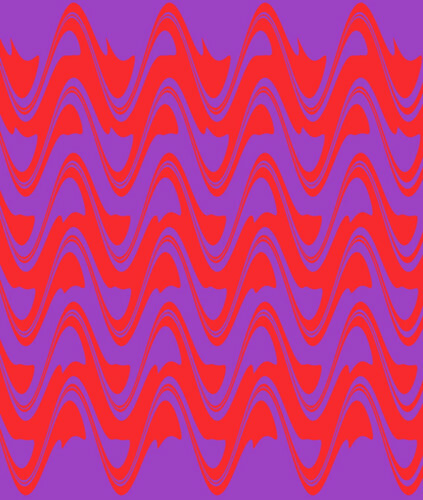 The hot colors and the shapes make me think of the samba dance moves, tropicalismo music, and the wavy designs on the sidewalks near Copacabana beach. Hence the title. Purple and Orange Marble Pattern, a photo by randubnick on Flickr. Today I used Painter to create this image. I created bands of bright red orange and purple, and then applied the marbling effect. I adjusted the controls until I got what I wanted. Then I cropped the image to get this composition. Fabric Flowers and Vase (Hemmed), a photo by randubnick on Flickr. 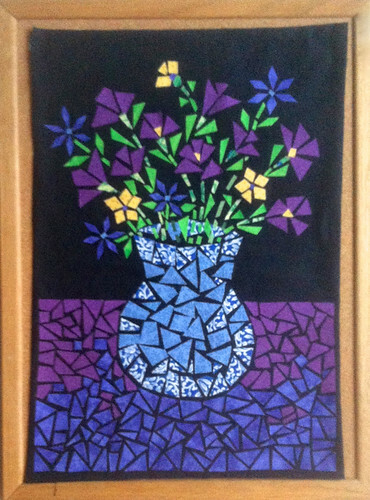 Several weeks ago, I finished the image in this fabric appliqué, a still life of vase of flowers done with iron-on fabric. For the past few days, I have been working on finishing the edges and hemming it by hand. The next step is to cold-block the fabric to get it closer to square. I did put safety pins at the top (imbedded in the hem) so it will be possible to hang it that way. But I have decided to frame it because I want it to be behind UV glass (to keep the fabric from fading). The other benefit is that if I use a black matt board as backing, any deviation from square will be less obvious. Flower Girl (Pen and Ink Drawing), a photo by randubnick on Flickr. This is another pen-and-ink drawing that I came across recently in one of my old sketchbooks. 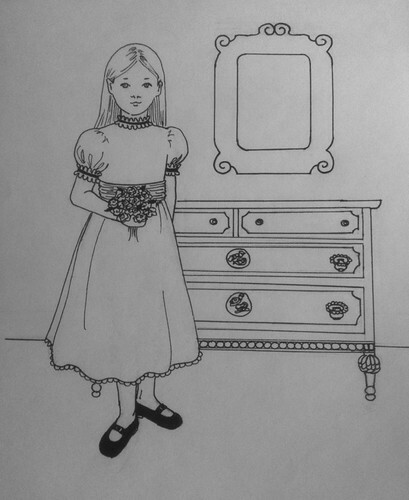 I was drawing from my imagination (though the chest of drawers is based on a piece of furniture in my house). Of course I can see some little mistakes, but what I like about outweighs the flaws. So here it is. Many Daisies Many Roses, a photo by randubnick on Flickr. 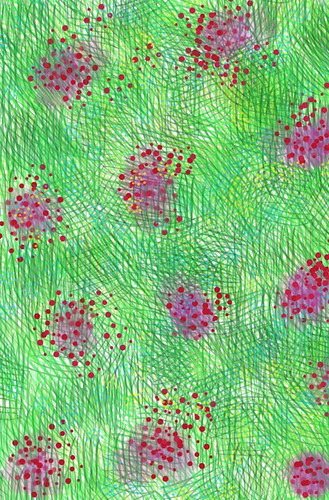 Yesterday's post was a digital drawing of daisies and roses, created on my iPhone with the Brushes app. Tonight I cropped the image a bit, opened it in Painter, and "captured" it as a pattern. Then I used the Paintbrush tool to fill a new canvas with it. Here it is as a vertical tile with no offset, which is the way I think it looks best. 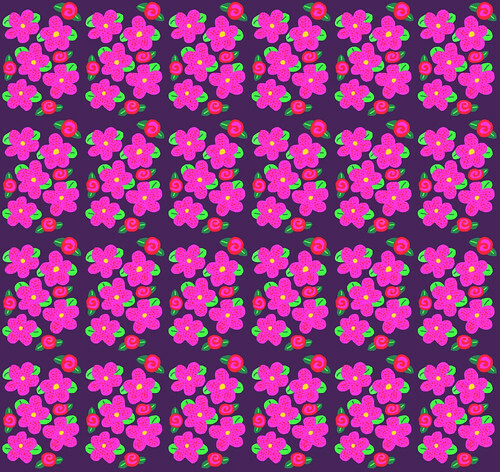 I think I might find a use for this pattern on Zazzle.